One day, about a week ago, I spent the majority of my waking hours on Blogussion.com. That’s right, the majority of the time I was awake that day I was reading articles on a website. Furthermore, this website was developed by a 15-year-old and a 16-year-old. It was unusual to say the least. Why did I do it? Blogussion is a website that focuses on providing tips for bloggers, new and old, to help improve their blogs. Side note, blogging is something that has never really interested me prior to finding this site. Alex (15) and Janith (16) have done an incredible job of designing and developing Blogussion. In the first week of the Summer 2009 JuniorBiz Project Charter traffic to my site increased 77% from 168 to 298 visitors. At this rate I will have over 280,000 weekly visitors by the end of the 13-week project charter. Probably not possible but it is a good start to the summer. 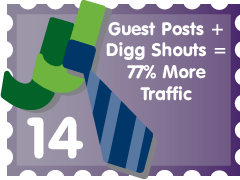 I implemented two new strategies this week to increase my traffic; guest post and Digg shouts. This week was the first week in almost 4 months I didn’t have a project charter to guide me, so I made a new one. Within the “Project Charter: Summer 2009” I established 6 objectives and 20 goals for my business. Setting objectives and goals is important for any business (especially new ones) and I’ll begin by describing exactly why it’s important and then list my objectives and goals for the next 13 weeks. Following up on my Twitter Experiment with Direct Messages… It was a success, but at what cost? I’ll go into more detail under Objective 3 in this post. Additionally, this is the final JJ Entry from the JuniorBiz Project Charter. In later JJ Entries I will focus on the cool things that happen to me and my business on a week-to-week basis.